There has been mention in the press of the discovery of a rapidly rotating supermassive black hole. It turns out that this is not a recent discovery, but rather we’ve recently been able to prove (rather than strongly suspect) that this particular supermassive black hole is rapidly rotating. The work was published in Nature (doi:10.1038/nature11938). Many supermassive black holes are “active” in the sense that they have hot disks of matter around them (known as accretion disks) and have high energy streams of matter streaming away from them (called jets) due to all the heat and energy of the material near the black hole. These active black holes are known as active galactic nuclei (AGN). The research team studied the AGN of NGC 1365, also known as the Great Barred Spiral Galaxy, which is about 56 million light years away. Because AGN have so much energy, they produce intense x-rays. These x-rays are only produced in the area of the black hole and its accretion disk, so they provide a good way to learn about the black hole itself. 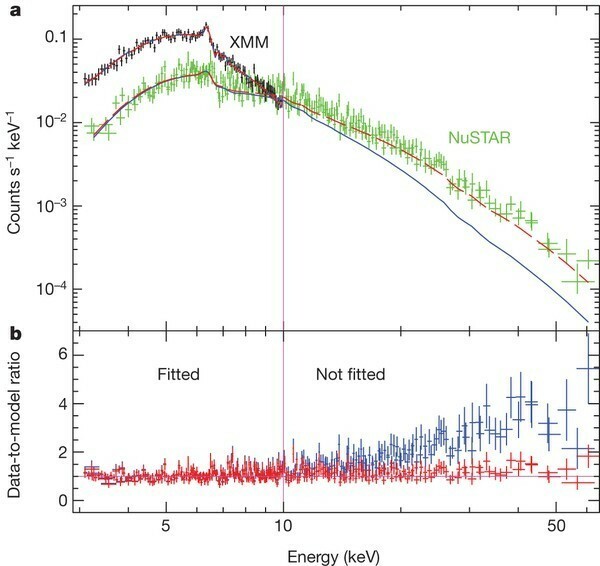 By themselves, these x-rays would be produced within a fairly narrow range of wavelengths, but in this case the x-rays we observe have a fairly broad range. This means one of two things: either the black hole (and its accretion disk) are rotating rapidly, or there is some material interacting with the x-rays after they are created. We’ve generally assumed the former. The basic idea is that as x-rays are produced they interact with the accretion disk of the black hole. If the black hole is spinning rapidly, it will cause the accretion disk to spin rapidly as well. This means when the x-rays scatter off the accretion disk they are Doppler shifted. If the x-rays scatter off a part of the accretion disk moving away from us, then they are red-shifted, and if they scatter off accretion disk matter moving toward us, they are blue shifted. As a result the rapidly rotating accretion disk broadens the range of x-ray emission. But other astronomers have noted that x-ray broadening can occur when the x-rays are absorbed by a gas or plasma and then re-emitted. So its possible that there is something between the x-ray source and and us. Basically that would mean we’re getting a cloudy view of the AGN, and the effect is to make it look like the black hole is spinning rapidly. This wasn’t seen as particularly likely, but it fits observations about as well as the rotation model, so we couldn’t rule it out. In this latest paper, the Great Barred Spiral Galaxy was observed by two space telescopes (XMM-Newton and NuSTAR) at the same time. This gave the team enough data to test both the rotation and absorption models. The result can seen in the figure below. The red dashed line represents the rotation model, and the blue line represents the absorber model. As you can see, the data agrees with the rotation model. 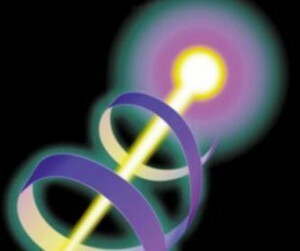 This means that while absorption can play a small role in the x-ray broadening, it is mostly due to black hole rotation. Once the team showed the supermassive black hole was indeed rotating, they went on to calculate just how fast it was rotating. What they found was that it rotating at about 97% of the maximum theoretical limit for a black hole. That means matter closest to the black hole is moving at about 97% of the speed of light. We’ve suspected that black holes would typically rotate, but now we know that some of them spin right round, baby.